Hard to believe this is the first day of spring here. The weather is shifting from day to day. We have warm spring like days and then a series of cold, freezing ones. The last few weeks we have had rain, hail and some snow. I have been in the process of cleaning my art room. I am into my second week of sorting, clearing, tossing and donating. It is amazing how much one can accumulate over the years. Projects that were never finished or even started. I am so visual and I love to collage so you can imagine the files of images, pages from calendars, magazines and such. I have literally gone through the files and piles. It does feel good yet still more to sort.I have been so excited to respond to all the incredible feedback regarding my new website, www.peggyblack.com. I invite you to visit and check out all that is offered about my work, my garden, and my personal experiences of transformation. I am planning to go to Kauai and visit my daughter for a couple of weeks next month. It will be so sweet to spend time with her. The probate is settled and now she needs to sort, clear and start the next phase of her life. I do seem to be the one my daughters engage to assist in cleaning the garage, packing to move, organizing and such. Many years ago I had a small business in which I actually did that for others. I was a professional organizer, long before the popularity of that service. I am inviting you to join the “Bless the WATER.” World Water Day, on 22 March every year, is about focusing attention on the importance of water. The theme for World Water Day 2018 is ‘Nature for Water’ – exploring nature-based solutions to the water challenges we face in the 21st century. Get Inspired! Make Waves! Hold an Event! Learn more and enjoy stories about nature-based solutions on www.worldwaterday.org or blessthewater.com or watch People are standing up for the Rights of Water on YouTube. Please contact me if you are interested in booking appointments to have a personal interface and connection with the ‘team.’ I love making the ‘team’ available for these sessions, they bring clarity and guidance. Thank you so much for your kind support. The emails, bluesky gifts and cards I receive from you are so inspiring. Your love and prayers are greatly appreciated. We are a powerful community of spiritual beings and I am honored to be a part of our service together. We are here offering our support and our acknowledgement for your continued commitment to transforming this reality. We are aware that you sometimes question that commitment and even wonder if you and your action are making any difference at all.Let us reassure you that you are making a difference. There are many, many more of you who are aware of your personal power to create. You are triggering and spreading this knowledge with everyone you encounter. This awareness vibrates in your energy field, it radiates around you, it is a gentle frequency that touches the other and reminds them that they are divine. You are making a difference every time you recognize a misqualified thought or feeling within yourself and when you shift that thought or feeling into one that is coherent, more loving, more inclusive. Realize that each and every time you shift a limiting pattern or thought to a more expansive one, the entire collective field is affected, is uplifted. Imagine that you are part of a movement, you are part of an evolution in consciousness. This is truly happening around your world, in small pockets of light, in large gatherings of conscious beings, in silent actions by the many light workers and transformers everywhere. Your numbers are growing; conscious light is igniting, kindling, the conscious light within others. More and more are waking up and becoming aware of who they are as magnificent multidimensional beings. Global gatherings are occurring because of your ability to connect with others around the world in a matter of seconds. Group mind is forming from the desire for life sustaining actions to be taking place. Meditation and prayers are being energized by larger and larger groups of people holding and anchoring the energy of peace and harmony. This is not the news that is broadcast. The news that is broadcast and shared is filled with misqualified energy and invokes the weakness of humanity. It emphasizes the negative, the dividing and judging, the pushing against. The collective energy field is impacted and empowered by those that focus. Remember what you resist will persist. So the best you can do from a place of awareness is to bless and transform all you encounter. Imagine if every awakened earthwalker would focus uplifting results to all situations that are reflected in the media and the news. There would be a shift, we can assure you. Instead of adding your energy to the negative that is happening and being reported, by expressing your disgust or shock or judgment, pause and reset your response. This is the ability to develop a new skill, the skill of a master. Bless those that are harmed, and envision a shift or change of positive being birthed from this event. Implant the seeds of this shift in the quantum field. Imagine a world in which this did not occur. We are not saying to ignore, or deny the horrific things that can occur on your planet. We are here to remind you that your physical experience in the dimension and timeframe is to bring about a life sustaining reality. You are a divine creator, a manifestor, calling forth what you focus upon. You are here to awaken from the mass unconsciousness of limitation and herald the coming of a dimension in which there is harmony, compassion, equality and the many uplifting expressions of love. We observe the unconscious ease in which you, as an empath, match the misqualified energies that surround you. There is no judgment about this; we are just offering this as a reminder. Remember that emotions are a vibration, a frequency and they are contagious. The conscious shift that is taking place, that you are bringing about, is the awareness that humanity has learned to repress their emotions, to store them in the tissues, bones, cells and organs of their bodies. These dense frequencies of misqualified energy and emotions create disharmony with the light body, or energy, as well as the physical form. There are many ways these emotional patterns and frequencies are repressed. Human beings have learned and are extremely skilled in suppressing uncomfortable, negative or misqualified emotions such as fear, anger, feelings of being unworthy, unloved, not having enough, deep sorrow and grief. Among the ways humans repress feelings are behaviors, substances and pharmaceuticals, as well as the most common method which is processed sugar. Processed sugar is the most legal addictive substance on your planet. It is used to shut those feeling down, to suppress and repress them. Processed sugar is the least expensive, most convenient substance to override your empathic abilities, which usually match the collective, and to keep any negative memory or feeling buried and stored in your physical body. Each and every being on your planet is sensitive and empathic. Many have done their best to shut this gift and ability down because it can be too painful, too disruptive, too uncomfortable. Yet as a divine being you are here to transform these very emotions and frequencies. Consider for a moment that you have repressed or stored a feeling of being unworthy from some early experience. You are now a responsible adult and moving about in your day; you pass someone on the street or at a social gathering who happens to be feeling unworthy (broadcasting a vibration of that unique feeling). Guess what gets triggered in your field? Yes, out of the blue, so to speak, you might begin to feel uncertain, unworthy, an old familiar feeling that you want to disown. Realize that your stored, repressed emotions can and will be activated by others, by their words, actions or silent vibrations that match your own personal unconscious emotions. Your goal always is to realize what has happened and allow yourself to process and clear those old stifled feelings rather than find a method to restrain them again. Each time you allow yourself to clear any stored pattern, you free yourself up. You will begin to be less triggered by others. You are a divine master of energy. You are here to transform all misqualified energy/emotions you have experienced, without judgment, without the story. Simply recall the feelings and witness the experience and allow yourself to express with sound the feeling of being angry, scared, unloved, unworthy. When emotions are express from a conscious place and a desire to clear them from your circuits, there is a shift. Once you have expressed those feeling, always declare and name the emotion/quality you want in its place. For example, express your anger or rage until it feels complete; now name and call forth a sense of peace or understanding and sound that into place. Each time you clear any personal misqualified or negative emotion you are also clearing an aspect of the collective misqualified emotions that match that vibration. This is the act of a Conscious Alchemist. Given the interest in Ascension, the Event, or a planetary heart opening, I’ve reworked two series from the past into one, going over all the voices I’m aware of who talk about the New and Golden Age. This can also serve as an introduction to new readers. “Yet, even as indeed we may be the Elder Brethren of your human race, and able to view the present trauma of your planet with detachment, still our duty and our joy is to release to your worlds some ray of that Divine Purpose by which all creation moves to its ascendancy. In the same collection of postmortem writings, the Polish martyr of the Second World War, Father Andrew Glazewski, used his time with Helen Greaves to report a Second Coming. “We can do so much more with your planet besides just looting and despoiling; and for that reason I am hoping that a moment will soon come when other beings will join you on earth to show and to demonstrate another way of living. I want you to reach out in thought to these greater beings by asking the Christ to bring his Christed ones within the earth vision. This is the plan for which we must prepare. It has been called the Second Coming. But it is not in the least like the original Coming of Christ. This will happen at first slowly, and all over the world people will appear possessing great dynamic force and power. 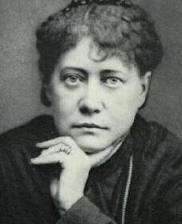 No one would associate Theosophy founder Helena Blavatsky with the late Twentieth Century. However, at the end of the 1970s, she returned, to Robert Leichtman to discuss the “new teaching” expected soon. “Humanity is tuning in, more or less consciously, to these particular forces coming from within, from the inner planes, at this time. This is one of the reasons why there is such a rise in the interest in psychic phenomena, after all – because we are all making ready for the reappearance of the Christ. Jesus only had one harbinger, but the Christ of the New Age is going to have several million harbingers. Ford felt a single individual would arise as an avatar, but, really, we have several avatars alive today. “Whenever there has been an avatar, there has been a lifting of the vibration of the whole human race. You can look for that and much more. The physical plane is rapidly moving into the fourth dimension. Part of the avatar’s work is to raise the consciousness of the planet so that this particular transition can be made. That is the first thing that will happen. “You’re going to be noticing within your lifetimes that some things are not working quite like they used to, and this will be an indication that this transition is happening. “At the same time there will be an increasing awareness of some of the inhabitants of the inner side of life – entities such as elves, angels, and spooks. This will be another indication of what is happening. Thus many guides and spirits have been telling us since the 1870s that we could expect a new era, a new world, a new revelation, and a new dispensation soon on Earth. It would totally recast human relationships, our relationship with the Divine, and the way life would be lived on Earth. It’s surprising how accurate so many of those sources are when compared to what the Company of Light are saying today. Their names for the advent of Ascension and the Golden Age may not have lasted but the details of what they expected seem to have been for the most part borne out. And now we stand on the verge of the first palpable Ascension events – perhaps a global heart opening – and the realization of all these men and women tried so hard to have us wake up to. The Great Awakening now begins. For your reading enjoyment, this series has been turned into a book. (1) Spirit teacher called “Elder Brother” in Helen Greaves, medium, Living Waters. Sudbury, Suffolk: Neville Spearman, 1978, 117. (2) Spirit teacher called “Elder Brother,” ibid., 117. (3) Sir Ronald Fraser in Cynthia Sandys and Rosamund Lehmann, The Awakening Letters. Jersey: Neville Spearman, 1978, 175. (4) Sir Ronald Fraser, ibid., 175. (5) Father Andrew Glazewski, ibid., 95. (6) H.P. 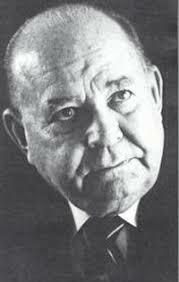 Blavatsky in Robert R. Leichtman through the mediumship of D. Kendrick Johnson, H.P. Blavatsky Returns. Columbus, OH: Ariel Press, 1980, 72. (7) Arthur Ford in Robert Leichtman, The Psychic Perspective.Columbia: Ariel press, 1978, 102. (8) Ibid., 103-4. I myself know one colleague of Jesus who returned and is addressing us. She also confirmed the following important equation with me. It may be somewhat contentious for some people and I regret any upset it may cause. The first three terms are the Trimurthy; the second three are functional descriptions; and the third are the cosmic forces, also known as the gunas. The Mother confirmed that they are all the same. Steve Beckow: I have a question for you from our Hindu readers. They want to know if the gunas, the cosmic forces which are called rajas, sattwa, and thamas, are the same as the Trimurthy [Triad] of Brahma, Vishnu and Shiva. Divine Mother: Yes. We are the same as that triad. SB: And the Trimurthy of Brahma, Vishnu and Shiva is a subset of the Universal Creative Vibration that you are at your essence. Is that correct? DM: That is correct. [The Trimurthy] is much the same as we have been speaking of. It is a way in which my beloved children can come to know me and to have that experience. It is formless, and yet it is form. It is a way of connection, and it is a way of understanding and entering into a higher vibration of being. So it helps the emergence into my energy. SB: Sort of like stair steps? “We are the same”: She’s confirmed that the gunas are a subset of her; specifically, of her energy as the universal creative vibration which we know as Aum or Amen. Aum is not coterminous with the Mother; nothing is. The Mother uses the Aum vibration to create worlds. But look again, in our hunt for identities. Let’s divide the sine wave that Aum is into its components: A-U-M = Akar, Ukar, and Makar. And what are they? We find they are the forces of creation, preservation, and transformation. 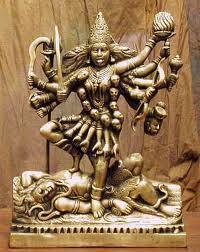 Brahma, Vishnu, Shiva = Creator, Preserver, Transformer = Rajas, Sattwa, Thamas = Akar, Ukar, Makar (AUM) = a subset of the Mother. The two equations suggested here strike me as basic identities in a cross-cultural spirituality. “The macrocosm and the microcosm rest in the Mother’s womb; now do you see how vast it is?” Sri Ramakrishna asked us. (2) Indeed, we do. Divine Mother: When I have spoken about … Shakti, I have spoken about a part of me. As I have said, I am the bridge. I am the clasp between the Father and the universe and your world. And Shakti has been experienced — yes, inter-dimensionally for eons, as you well know – but she is not the totality of my being. My being is bigger than you can fathom, dear one. It turns out that these three entities are levels of consciousness. Or levels of love. Or levels of bliss. All roads lead Home, to the higher dimensions beyond the seven-chakra system. So for the benefit of all devotees of the Mother on Navaratri, this is the most up-to-date account I can give you on the nature of the Mother we all worship. (1) “The Divine Mother: Come to Me as I Come to You – Part 1/2,” Oct. 17, 2012, at http://goldenageofgaia.com/2012/10/17/the-divine-mother-come-to-me-as-i-come-to-you-part-12/. (2) Paramahansa Ramakrishna in Swami Nikhilananda, trans., The Gospel of Sri Ramakrishna. New York: Ramakrishna-Vivekananda Center, 1978; c1942, 106. (3) “The Divine Mother: Come to Me as I Come to You – Part 1/2,” Oct. 17, 2012, at http://goldenageofgaia.com/2012/10/17/the-divine-mother-come-to-me-as-i-come-to-you-part-12/. (4) Which enlightenment experiences happen at the fourth, sixth, and seventh chakras. Ascension occurs beyond the seven-chakra system. The opening of the seventh chakra or Sahasrara leads to Brahmajnana or God-Realization, a transcendental experience. But it’s still only halfway up the mountain. Beyond it is Sahaja Samadhi, which is the culmination of our Ascension. Sahaja is a permanent heart opening and is known as mukti or moksha, liberation from Third-Dimensional birth and death.